"Building Spacesuits" is featured in Popular Science Magazine. Shane Jacobs is the lead graduate student in this research. At the University of Maryland's Space System Laboratory (SSL), a research team has developed the MX-2 Suit. Graduate aerospace engineering student, Shane Jacobs' photograph is featured in Popular Science magazine. The Maryland Advanced Research/Simulation (MARS) Suit is a low-cost test bed for extravehicular activity (EVA) research, providing an environment for the development and application of biomedical sensors and advanced EVA technologies. It is used in the Neutral Buoyancy Research Facility, allowing students and researchers to gaining more experience with human-telerobotic interactions in an integrated EVA worksite. MARS Suit is currently in its second generation (MX-2) design. The project advisor is Dr. David Akin and the lead graduate student is Shane Jacobs. 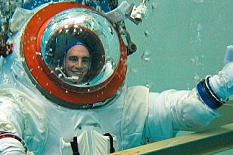 Initial tests and applications of MX-2 include correlation of MX-2 performance in EVA tasks to both neutral buoyancy and space flight performance in shuttle suits, tests of various approaches to EVA/robotic cooperation, and development of a virtual reality visual environment integrated into neutral buoyancy simulations. View the complete article online at the Popular Science website.